Cheetah habitat and how do they survive? Cheetah habitat is mostly open plains, grasslands, woodland, savannah, arid regions and even mountainous regions of East Africa, in vast national parks like the Serengeti, Masai Mara, Kruger National Park and other smaller parks. Since they are few and relatively vulnerable they tend to be very careful to show themselves. Their habitat all depends on the abundance of food and the presence of bigger predators. 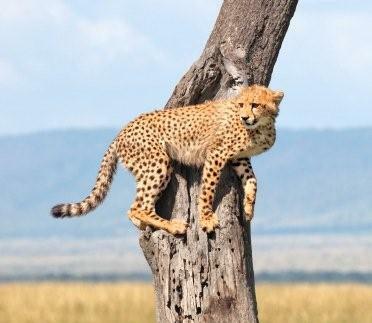 Cheetahs use their exceptional eyesight from high points such as trees, rocks to observe and smell any potential preys. The main threat to cheetahs is the loss of habitat as open plains, woodland and others are common living places for other animals and...humans. More and more ranchers have settled where cheetahs used to live that has reduced their habitat.And lots of farmers have killed cheetahs who like to live around farms for easy preys. In Namibia where there was a big concentration, the population has declined by half in the last ten years. To give you an idea, 715 million cheetahs were living in 1750 and 6.7 billion in 2008. It's one of the reason why there are more and more national parks nowadays: to protect this endangered cat and other species such as elephants, lions and rhinos.